The Platform Configuration should be 4392 to get the Prime Video player. Make sure you are in the normal (non testing) group and check for updates. It should then restart with Platform configuration 4392 and the player will be there. I have a TRT1000 - since update the device will not connect to the internet - has the update cause this? No nicci. This update was for T2100s & T2200s only. I have a TRT1000 - since update the device will not connect to the internet - has the update caused this? As Visionman says, it can’t have. Accordingly, while not recording nor about to, touch the centre ring on the fascia of your box for just over eight seconds, until it non-destructively soft reboots. Then please come back and tell us the results, if this fixes it or not. If it doesn’t, we have a few other things you can try. For which it will be useful to know who your ISP is, how the box is connected to your router (direct Ethernet cable or PLAs (Power Line Adapters), what make and model your router is, and where the box came from (Retail, BT Retail, or BT subscription). And if the latter, is the subscription still in place? Look more closely at that ‘update’ date - it will say it’s the last time the box checked for updates, not the last time it actually downloaded and installed one. If you check which update you actually have, in Settings/Information and Reset/Software Information/Manufacturer Software, I would expect it to be 29.104.0 (rolled out from 23 April 2018 onwards, and now complete); and in Device Information next to Software Information, you to see Variant 80B08500. Can you check and see if this is indeed the case? Then, in Broadband Connection at the top of Settings, please report what you see. In particular, is it set to Automatic? If not, set it to that and try again. If all is as above (or indeed, even if it isn’t), then when not using your box or the internet, switch off the box at the mains, and then reset the BT router. When it has completely settled, and not before, switch your YouView box back on and let that settle. A final test for this go-round is to take a laptop with its WiFi disabled, or other device that you can disable the WiFi on, connect that to the YouView end of your Ethernet cable, and see if that can access the internet OK. If it can (and you have double-checked WiFi is off, and the device really is using the cable) then this will eliminate any possible cable issues. If it is the cable at fault, swap in a new one. If you get this far and still can’t connect, come back for more advice. We still have one more trick up our sleeve for a more drastic reset, but which still preserves your recordings at least, if not much else. Great! Let’s hope it can stay that way, now. Updated yesterday 20/06 at 12.45am. Hard reboot now performed to no effect. Could it be this software upgrade is the cause of my box failing to playback radio recordings? We're aware of an issue with this release where users are no longer able to play back radio recordings or listen to live buffered playback even if the recording was prior to this update. This is being worked on as a priority and we hope to have this resolved as soon as possible. If you ever pause a radio channel and then play again, we've found that unplugging and then plugging back in the HDMI cable usually resolves this particular issue and the audio comes back. Unfortunately we have no mitigation tips for the radio recordings however we do suggest you keep them in your MyTV section as they should be working again once we've pushed out a fix for this issue. Apologies for any inconvenience caused by this issue. Do you mean you were recording two internet channels whilst pausing a previous recording of ITV (ie not live)? 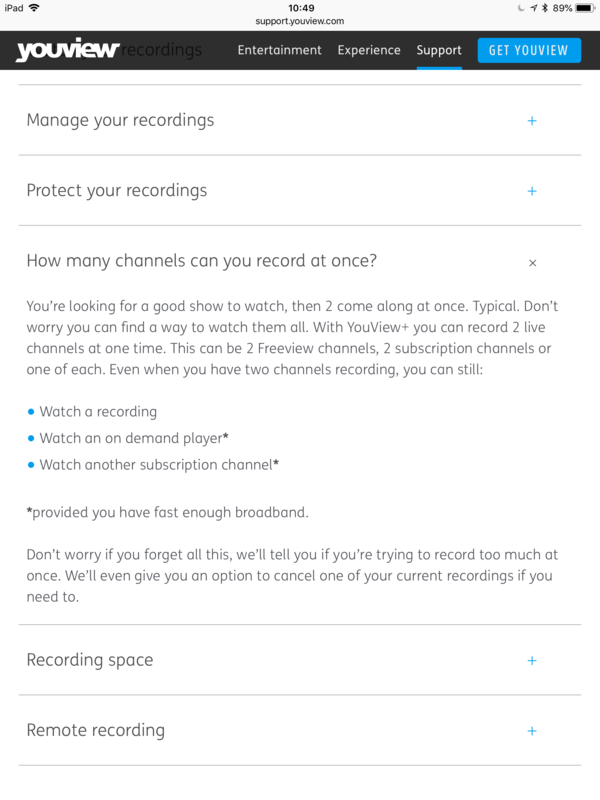 I believe that if you are currently recording 2 channels then you should still be able to watch further content from either your MY TV (ie a recording) or from one of the Youview Players or Apps. @simonp99 scenario is outside of that. I seem to remember when IPTV was launched that I tried recording 2 IPTV programs & a Freeview one at the same time & it did work. But that was an early OldGen version. On many devices over time watching an additional channel when 2 or more channels being watched and/or recorded were from the same source eg Freeview (mux) has been possible but that has tended to be non advertised feature that was or is possible in only certain scenarios. I agree. However, when watching or recording 2 live internet TV channels, whilst they don't use the 2 tuners per sa, they are disabled whilst doing so and that has always been the case. So the scenario simonp99 describes isn't possible, as a YouView only has 2 tuners. In regard to zulu17's post, which is true, it is possible to record up to 3 DDT channels at the same time if 2 of the channels are on the same MUX, but this behaviour doesn't include internet TV channels as they don't have one. I believe that if you are currently recording 2 OTA channels on the same MUX, you can watch any other one live OTA channel you like, or you can watch a live internet channel. And that if you are currently recording 2 OTA channels on different MUXes, you can watch one other live channel, as long as it is on one of the two MUXes you are recording from, or is an internet channel. Less certainly, I believe that if you are recording two channels, and one or both are internet channels, you can still watch any other one live OTA or internet channel you like. i.e. the restrictions are to a maximum of three live programmes, and a maximum of two MUXes, but anything within those constraints is permitted. You are also limited to two scheduled recordings at a time; while the YouView box can record three channels at once, and indeed does so in the above scenarios, the third recording is restricted to supporting pause and rewind of live TV on the channel you are not making a scheduled recording from. Sorry, the scenario both zulu17 and I posted is true. But neither include internet channels. live recording on ITV was still working ( I presume) however it would only work in play or pause mode. Typical Humax they don't like fixing things IMHO would rather sell you a new box. The scenario from @simonp99 we are discussing includes internet channels, so to omit the discussion of scenarios that don’t, doesn’t get this any further forward. But you are saying that an internet channel effectively replaces a MUX, for the purposes of determining how many things you can watch or record at once, so once you are recording two internet channels, you can’t watch a third, or anything OTA? And so @simonp99 couldn’t possibly be doing what he said he was doing, he must have been mistaken in some way? And when recording one internet channel and one OTA channel, you cannot watch another internet channel, and can only watch a further OTA channel if it is on the same MUX as the OTA channel you are recording? I am entirely prepared to believe that all the above is true, as I don’t have a BT TV subscription that would allow me to record internet channels, and so I have no experience of them (hence my ‘less certainly’), and it all seems entirely plausible and logical, but I would appreciate a confirmation. As while you say zulu17 and you are correct, at the very least your ‘possible to record three channels’ requires the very careful qualification I gave it, so some greater precision here would be welcomed. I've given all the info so someone with access to the source code ought to be able to reproduce this fault and fix it. I don't see why the ability to fast forward a live paused channel is any thing to do with how many channels you can record at a time. I could play it at normal speed. It doesn't mention recording two subscription channels and watching a Freeview one. It does say that warnings are given however, I didn't see any. You have always been able to record two OTA channels and watch a third under the conditions I describe above for OTA, and as far as I know YouView haven't spiked the options there, but they have always fought shy of trying to describe the ‘2 Muxes’ rules, lest they confuse their target market. And as it stands, you can do everything it describes; but it doesn’t describe everything you can do. But one thing it does describe that you can do is record two subscription channels, and still watch a third. And this casts some doubt on Visionman’s assertion that watching or recording an internet channel correlates with disabling a tuner. i think that the YouView box has two tuners, but three recording streams, and it is a recording stream that an internet channel takes up; and if I am correct, then you should be able to watch and record any combination that does not require more than two muxes, and obeys the proviso that the third ‘recording’ stream is a non-schedulable one, for pause and rewind purposes. And if you can have two internet channels, one a ‘scheduled’ recording and one a ‘third’ recording, while the second ‘scheduled’ recording stream is an OTA channel, it seems unlikely to me that you can’t record two internet channels and watch one OTA one. But what do I know? Perhaps some kind soul with a subscription box will try it for us. Perhaps even Visionman, who will, I am sure, be anxious to test his assertions in this matter, but who can be relied upon to bring us the truth of it, no matter what that is. For completeness one could consider that which tuner the box uses to record a given OTA channel is potentially at the manufacturer software layer, i.e. the Huawei and Humax layers. I seem to recall in some distant discussion mention that in this regard the Humax box may be optimal in using 1 tuner if both channels being recorded are on the same mux, and hence allowing you to watch any 3rd channel, whereas the Huawei one used a tuner per recording, and thus was more limited in the 3rd channel one could then watch. Whether that is entirely accurate and whether it remains the case would require people to run some quick tests on the different boxes. OK, anyone who is following this thread and has a BT TV subscription on a Humax box - we had better say that, given Keith’s suggestion that perhaps Huaweis work differently - can easily try setting up two simultaneous IPTV recordings, and then try to watch an OTA channel at the same time as the recordings are in progress. Would some kind souls like to try this, and let us know the result? Or maybe @Sarah could try it on Monday, and nip in the bud the nonsense that is breaking out here? We may all differ on matters of opinion, but it is a sad day indeed for the forum when we have to differ on easily resolved matters of fact. I did this yesterday as a test , on OldGen admittedly - recording 2 BT Sport channels & was able to watch ITV live. I was able to pause etc but not able to set that channel to record. I didn't try doing that via the guide or app btw.